Sounds like rubbish to me. Do you really think that a 5 minute weather diversion (or an orbit for that matter) would have any bearing on whether they could complete their 4 sectors? What would have happened had they been held at Singapore the first time? Our rules have always had allowable extensions; I'd be very surprised if the Indons don't have. Either that or there is a very dodgy mindset present here. Flight and duty times in Indonesia are 14 hours duty time (with up to 3 hours extension) and 9 hours flight time. Abit more than in most countries, but you'll find that flying four sectors a day is the norm these days (even at Lion apparently, since the Bali Kuta beach landing). 06:12 QZ8501 requests left deviation from airway. Deviation approved. Who was the nearby traffic and what exactly was their seperation at 06:12? Was it flight UAE-409, AIr Asia flight M635 etc and how come none have reported unusual effects due to weather? Could it be that a weather 'bomb' is so confined to such a very small local area that craft in the region experience little or no effects from this hazard? hail shaft can be very isolated..
“.......Five major parts of the Airbus A320-200 have now been found off the island of Borneo. But rough weather last week hampered the search, a huge operation assisted by several countries including the United States and Russia. "JAKARTA - The chief of Indonesia's search and rescue agency Basarnas expressed optimism on Sunday that the black box of AirAsia Indonesia flight QZ8501 was located "not far" from five large objects the search operation had spotted in the Java Sea. "The black box should not be far from the five significant objects we found," Mr Fransiskus Bambang Soelistyo told a media briefing at the agency's headquarters in Jakarta late on Sunday. Officials had believed they were close to a major breakthrough after pinpointing five large objects on the sea floor thought to be parts of the Airbus A320-200 jet this weekend. But Mr Bambang Soelistyo noted the ongoing difficulty facing the multinational recovery operation: "Our challeng is mud. Lots of mud at the sea bottom.”.....Up to now, he said, no vessels had detected any signal beamed from the black boxes, or flight recorders. He said five vessels with the ability to locate black boxes will be assigned on Monday. The weather also remains a problem, he said. "Several (divers) tried to dive but had to return. Safety is also important for rescuers," he told reporters...."
The other traffic in the area probably just did a better job deviating around the weather. The update above by jcjeant is clear but it sure doesn't seem to match even 50% of the post so far on this thread. I'm all for some speculation but there seems to be too many twists and turns of sub level (given that. given that, given that) this probably happened conclusions. Nothing on the sea floor as yet confirms that the main wreckage has been found, let alone understood regarding how the plane entered the water. Maybe it's just me and I missed something said earlier but how does the day of flight permissions have any bearing on this accident cause? One interesting line in that news item is "Indonesian transport minister threatens to sack those who cleared QZ8501 for take off when AirAsia was not permitted to fly on Sundays" - not that it has any relevance to why the accident happened. Also interesting is that no pings received from the black boxes - I wonder why? Flightradar's ADS-B for the end of the flight. Someone has commented on the 7001 squawk, which puzzled me when I saw the FR24 playback. 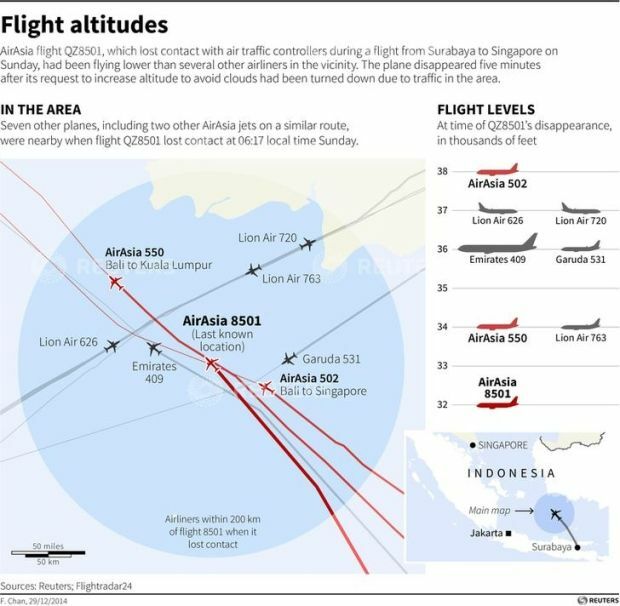 The AirAsia flight following just behind squawked 7002, I seem to remember. Are those squawk numbers allowed for civilian flights in that airspace? I would suggest, from a quick look last valid position was 23:12:01 - it seems to slow then stop after that? As does the data rate (from every 3s to a big gap). Quick calc by me makes it 494K? Are the 3rd/4th columns from the right TAS & Hdg? Track? 2nd V/S? Last column? Raft would appear to be partially inflated as it comes aboard? Are the 3rd/4th columns from the right TAS & Hdg? Is that not an escape slide? (Which granted may be used as a flotation device). From the CAPE values (around 2000 J/kg) indicated by the model analysis I calculated MAXIMUM updraft velocities of around 55 knots. In reality, rain-loading of the updraft reduces actual velolcities by maybe 30-40%, but let's allow for some stronger outliers too. I still can't see 100 knots being possible, but that's a moot point at this stage. I realize that I increased the amount of the updraft it was for simplicity of calculation. I still think that the more likely cause of the upset would be the coincidence of a severe updraft and a jump in OAT that would confuse the ADIRUs. If that was linked to sudden accumulation of clear icing from liquid water droplets in the updraft that could block pitot/static ports, then things could get very confusing for both the automatics and the flight crew. 2. Sudden loss of reliable pitot/static information (possibly associated with (1). The response of the FMC to the AIDRUs could be added to a sudden updraft with a VS of let's say 5,000fpm (to use a value in line with your CAPE values). If the FMC initiated a 'protection' pitch up at the same time as the ambient air was lifting the aircraft at 5000fpm it might explain the apparent unlikely climb rates. Or maybe it has, assuming the passenger quota for SUB-SIN was correlated to all the other flights through the area and had something to do with potential safe AC density and separation in an habitually weather threatened airspace. The machine has radar. It has multiple sensors and computers. When it sees that it is about to enter a turbulent zone as detected by radar, or indeed enters one, why can't it go into a 'Cautionary' mode where it will be anticipating conditions (large buffets, icing) and react accordingly, instead of not anticipating anything, flying along as if it is blind when it is in fact not, and blithely and stupidly sounding stall warnings when the airspeed drops by a ridiculous amount in an incredible time? If you're going to automate things, then automate them. Don't even display data that fails creditibility tests - it just confuses the pilots. Just pause the game, maintain thrust and attitude and display possible viable alternative data such as INS derived airspeed and AOA* to the pilots, remain engaged using such data but give the crew full unrestricted control if that data indicates flight outside its parameters. Do this until such time that conditions are such that credible data is again calculable, verified with the INS data, and only then display that data to the crew. Its no use having the million dollar computer display rubbish to you. "Is that not an escape slide?" - indeed, but when detached becomes a 'raft' as per drills. "not that it has any relevance to why the accident happened. Or maybe it has.." - no - totally itrrelevant. This is a route licensing issue and has zero to do with this accident as far as I can see - a true 'red herring' which could even be 'political' trouble-making by another carrier. Absolutely not. Reason(s) for the Minister agitation is elsewhere, and he is not finished as I heard. I understand very little about the ASEAN Open Skies policy, implementation of which is supposed to be complete by year end. But it does seem to be creating some friction between Indonesia and Singapore. That the Minister repeatedly failed to enforce an agreement between the two countries probably puts him in political hot water. Hence this unexpected CYA blame-shifting. Last edited by thcrozier; 4th Jan 2015 at 18:09.